History Adventuring: The marketing of Scottsdale, Arizona as the "West's Most Western Town"
The marketing of Scottsdale, Arizona as the "West's Most Western Town"
I was talking to one of my top PhDs (Phoenix History Detectives) today about how ridiculous it is that Scottsdale created an artificial image, starting in the late forties, as "the West's Most Western Town", and I thought that, as an old Marketing guy, I would try to explain why that happened, and why it made Scottsdale so successful. First of all, let me clarify that Scottsdale really does go back to the 1800s. It's not quite as old as Phoenix, or Tempe, but it's been there for a long time. It grew up with the Arizona Canal, which was completed in 1885. And like Phoenix and Tempe it began as an agricultural area. And yes, cowboys lived there, and rode horses around and all of that stuff. But Scottsdale became wildly successful because it paid attention to a market that was exploding after World War II, tourism. 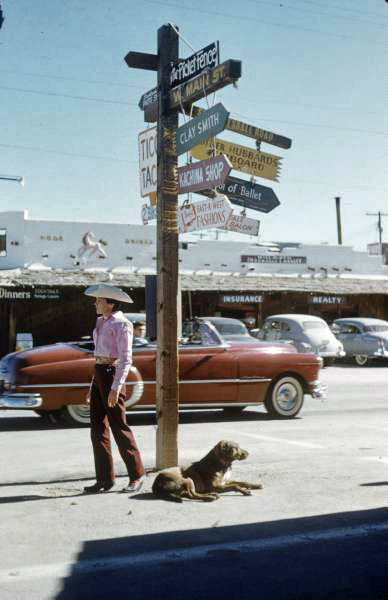 Scottsdale, Arizona in the 1950s, building its image as the West's Most Western Town. It still looks a lot like this to this day, in Old Town. Scottsdale did everything right. They set out to make the experience of visiting there to be an absolute fantasy. And if you've visited Scottsdale lately you know that they're still doing it right - I mean look at those resorts, and those golf courses! And it all has to do with brilliant marketing. Yes, Chamber of Commerce stuff. When people think of Scottsdale today they think, in addition to some of the finest resorts on planet Earth, of the very finest Western art. I'm no expert on that kind of stuff, but I understand that there are some awesome works of art, and jewelry, and such to be had there. 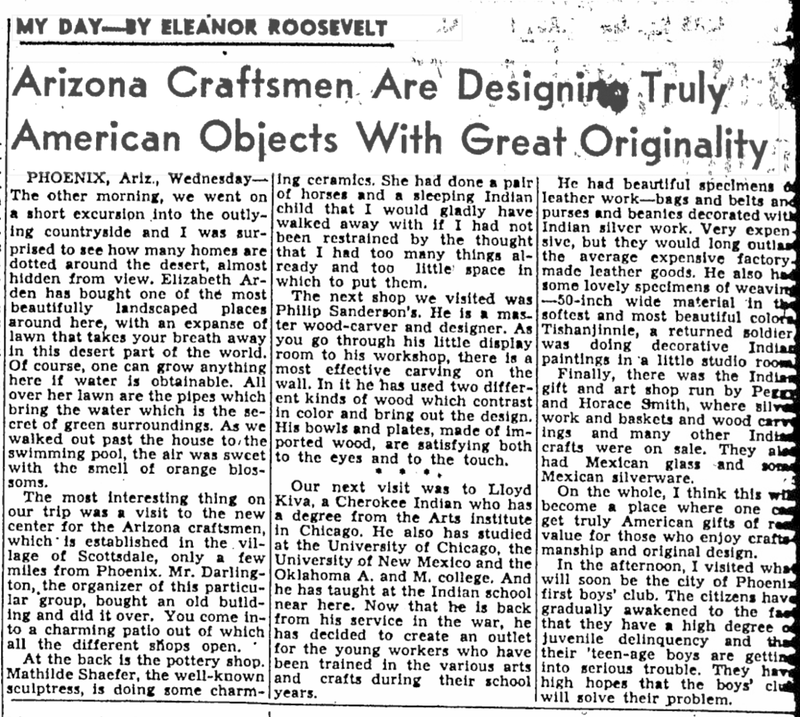 1946 article promoting Scottsdale, Arizona, written by Eleanor Roosevelt. 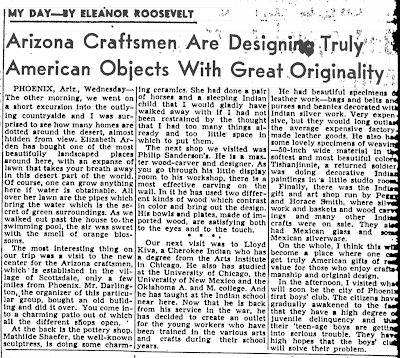 And that "Scottsdale snootiness" goes back to Eleanor Roosevelt, who helped to promote what was called the "Arizona Craftsman" movement. And if you can get the wife of the most popular president of the 1940s to help promote your city, let me tell you, you got something there. We're not talking about some cheesy "tourist" costume jewelry here, we're talking about what came to be considered the finest Western art to be had. 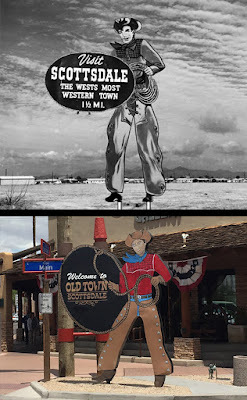 And Scottsdale did even more, they designed an area called "Old Town" to look a certain way that attracted tourists. 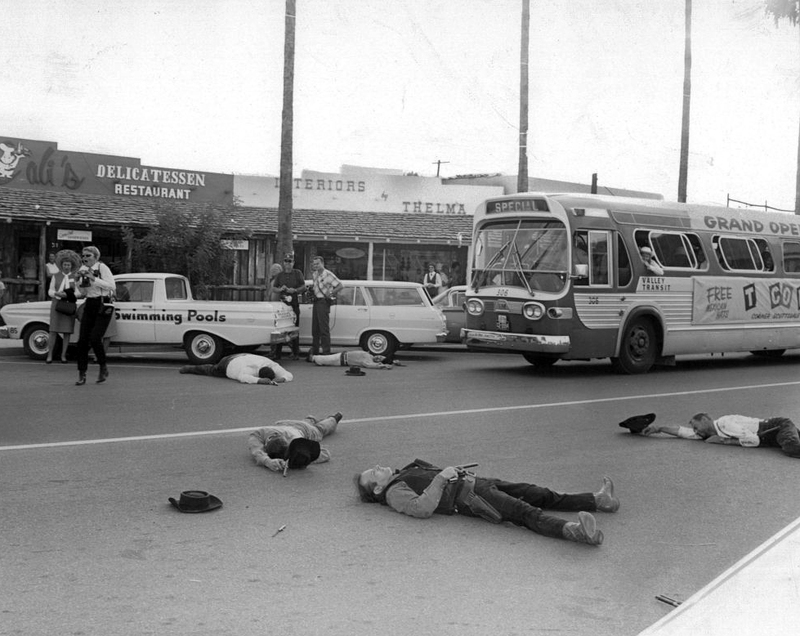 They had promotions, and events - even "Wild West" shootouts on the streets. And as an old Marketing guy, I gotta tell ya, I'm jealous of the genius that created that, and sustains it to this day. 1966 staged gunfight in Scottsdale, Arizona. This wouldn't work so good nowadays, but back then people loved it. Yes, Scottsdale as the "West's Most Western Town" is an illusion created by the Chamber of Commerce, mostly based on Western movies. And it became wildly successful going back to the 1950s, and like all good Old West stories, it really doesn't matter if it's a tall tale. I call it "the West of the Imagination". Become a PhD (Phoenix History Detective) today on Patreon!